I have been on The Fast and Furious marathon for a few days. Here are a few words to describe pretty much the whole series. These are the elements that made Fast and Furious one of the all time highest grossing franchise, apart from my favorite Harry Potter series. I'm not an avid fan of this series, in my memory, I've only watched the 2nd and 3rd movie. Coz I don't like most of the elements listed above. I'm more of a romcom and fantasy type. Oh did I mention that how magical and wonderful Cinderella is? I didn't anticipate or plan to watch the latest installment of the series at first, but everyone kept posting about it in Facebook, describing how touching the ending was, and then one of my acquaintance said that Paul didn't die in the movie. It got me interested, coz I thought it would be otherwise. Hence, here I am writing a review after watching the movie. Let me tell ya, it was the most sentimental action thriller I've ever seen. You don't usually see sentimental scenes in thriller, plus we all know that Paul had actually left all of us, making the ending seem extra woebegone, I can feel that the whole cinema was filled with sorrow ambience. The screenwriter did an excellent job for the ending. Instead of letting Brian O' Conner somehow dies in an accident (that's what I thought), he made a perfect farewell for the character and nothing is more beautiful than that. Almost shed a tear when the flashbacks of Brian were shown and the scene where he and Dom depart their own ways at the fork of the road. As for the perilous stunts, I don't need to mention how nerve-wracking it was to see all those scenes. And flying cars? Now that's something new, it took the world of racing car into a whole new level, it's like defying gravity. My adrenaline was rushing like hell watching the car flying from building to building in the Dubai scene. So when I have watched the previous movies, everything seems a bit bland, coz none of those can beat flying cars. If there is gonna be Furious 8, the screenwriter better come up with something that is more exhilarating than flying cars and how to continue with the family concept without Brian anymore. Of all these movies, I find that Fast 5 is the most illogical among the series. It has too many loopholes. As for the question of existence of Han, and you are just confused as I am, you can visit this website to understand the chronology of the whole series, because apparently, the movies are not in their sequence, especially Tokyo Drift. Oh, one more thing, a huge bravo to the screenwriter for the character of Roman Pearce, his presence just made the whole movie a lot more interesting. It's really sad to know and accept the fact that someone had actually left us, He was just 40 when he died in that horrible car crash. How could God took someone so talented, handsome right at his height of his career? Sometimes life isn't fair, but that's how it works, when it's time to go home, you go. Someone wrote this comment as a joke, he said :" How about I give you(God) Justin Bieber, and you(God) give us our Paul back? " Well, if I have the chance to trade, I'll trade Miley Cyrus or just any other criminal. 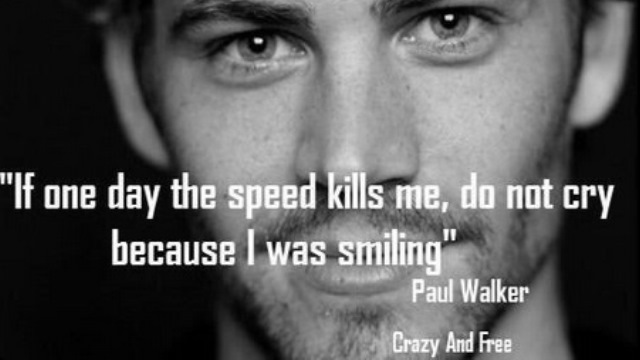 Sports car made up Paul's life, but it also took it away. Ironic. By the way, did you know that Vin Diesel has a twin brother called Paul Vincent?